Click HERE for Day 5 of the 7 Days of Easter Projects. 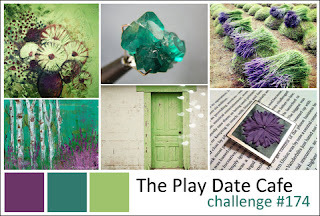 Welcome to this week's color challenge from The Play Date Cafe! Our colors are Amethyst, Emerald and Peridot. Our sponsor this week is The Crafts Meow. They have generously provided the design team with stamps and it's their celebrating their 2nd Birthday!! 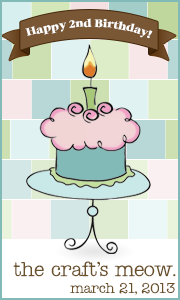 Happy Birthday TCM!! 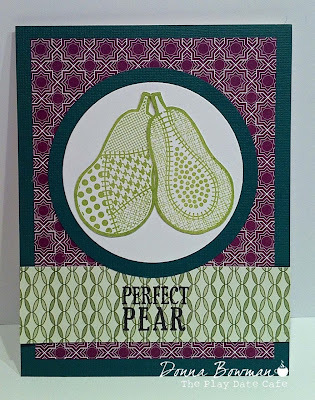 For my card I used TCM stamps and the patterned papers are from Stampin' Up. I stamped the pears in Memento Chalk Ink in Tea Leaves. I love purple and green together so I had fun making my card this week. Be sure to check out all the fun they're having at The Craft's Meow this week. And, our lucky winner will get a prize from TCM. Fantastic card, Donna! Thank you so much!!! i love these papers you used, and they fit with the stamp perfectly. this is beautiful! So stylish and BEAUTIFUL! Love your take on those colors! Another great card Donna, such a great choice of papers and stamps for this weeks colours! Great way to represent the colors of PDCC, Donna! Those pears look perfect nestled with each other.